Enjoy complete care and total peace of mind with MyLeightons. The MyLeightons Care Plan is the easy way to look after your eyes and hearing – for life. For just £12 a month, we’ll deliver the highest quality care you need, along with peace of mind, convenience, and a range of valuable benefits and exclusive money-saving offers. To sign up, just speak to a member of staff in your local branch. Children under 19 living at the same address have a complimentary upgrade to their NHS sight test and benefit from the same discounts when buying adult glasses. Membership of MyLeightons means complete peace of mind for your eyes and hearing, all for just £12 a month. To sign up for your MyLeightons Care Plan, just speak to a member of staff in your local branch. If you cancel after the minimum term of 12 months, then you can sign up again whenever you would like to do so. If you cancel before the minimum term of 12 months has ended, then you will either need to pay back the discounts given or pay the remaining fees due of the 12 month period (whichever is the lower). Second pair of glasses (including lenses) must be purchased within three months of the initial pair to qualify for 30% off. Claim for accidental breakage cover for prescription glasses must be within the first year of purchase to qualify for 50% off retail price. 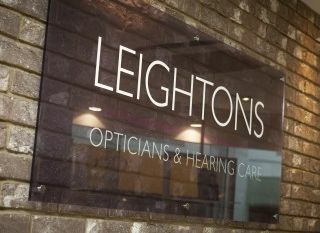 To benefit from the contact lens offer, each member of the household must have their own MyLeightons Care Plan (including children under 19 living at the same address). Second set of hearing aids must be purchased within one year of the initial purchase to qualify for 30% off (excludes Lyric purchases).